In this text, we will talk about the features and structure of cone crusher. 2. 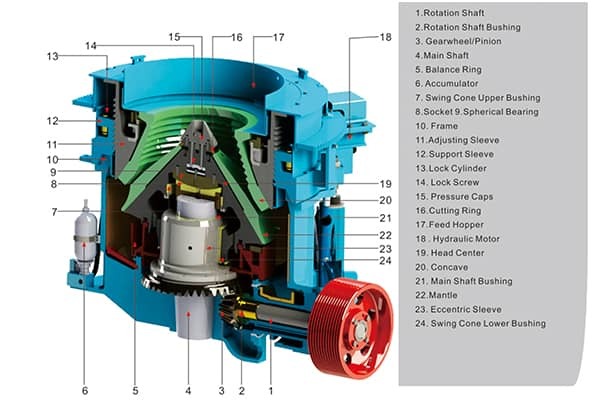 Reasonable structure and suitable parts material ensure the machine has long service life. 3. The crushed products had uniform particle size, reducing the circulating load. 4. Adoption of grease seal can avoid the blockage of water supply and drainage system. Cone crusher is mainly composed of frame, fixed cone, movable cone, and drive device. In addition, the auxiliary part of cone crusher includes electrical system, thin oil lubrication system and hydraulic system. Previous Article：How to Solve the Failure of the Crusher Reducer?